AHOY THERE - SPOILERS AHEAD! Yes, there are indeed spoilers ahead. It’s nigh on impossible to discuss this adventure without revealing major details of its plot, because the nature of it changes with each of its four episodes. Don’t do what I did, which was accidentally read on the internet that the Land of Fiction (from The Mind Robber) is one of the story’s settings! That realm does not appear until the very end of the tale, however. Though it’s hard to be sure, I don’t think I would have guessed its involvement until Part Four, when the hints dropped by writer/director Barnaby Edwards begin to point clearly in that direction. Prior to that point, this is a tale of the Doctor’s (Colin Baker) presumptions about his environment repeatedly being proven wrong. At first, he thinks he’s materialised his TARDIS on board the luxurious Queen Mary, until Jamie (Frazer Hines) notices the name Titanic. However, this too is revealed to be false even before the first episode has elapsed, and the ship is transformed into the Titan, a vessel that shares a similar fate, its occupants (played by Matt Addis and Miranda Raison) altered along with it. The Doctor attributes this effect to a divergent timeline - until Jules Verne’s fictional submarine the Nautilus arrives upon the scene. There’s a real sense of “what the...?” and some great cliffhangers as the plot unfolds. Miranda Raison is well qualified to play the dual roles of the English Tess and the American Myra. Best known for her regular role as Jo Portman in Spooks, she also played an American (Tallulah) in Doctor Who’s Daleks in Manhattan / Evolution of the Daleks. Star Trek: Deep Space Nine’s Alexander Siddig is well cast as the mysterious Captain Nemo, who plays an unexpected role in the story. 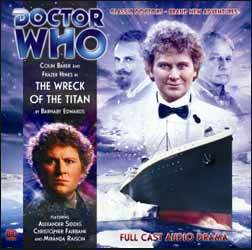 Despite its miniscule cast list, The Wreck of the Titan has an epic quality, thanks in no small part to the strident incidental music of Howard Carter, much of which is inspired by James Horner’s majestic score to James Cameron’s Titanic. In addition to Cameron and Verne, this adventure also takes its inspiration from Morgan Robertson’s 1898 novella Futility, or the Wreck of the Titan, which was published 14 years before the Titanic’s disastrous maiden voyage, but shared many remarkable characteristics with it. The first disc of this two-CD set also includes ten minutes of Carter’s music, while the second concludes with sixteen minutes of interviews with the cast and crew. This is not a self-contained adventure. Even more than the previous story, City of Spires, it leaves unanswered questions to be resolved in the next release, Legend of the Cybermen, and its cliffhanger ending means you’ll definitely want to listen to that one as well. Hopefully it will be as entertaining as The Wreck of the Titan.